The stomach shows receptive relaxation, accommodating large volume of food. The receptors for this are present in the wall of pharynx and esophagus. The function of fundus and body of the stomach is to store the food (storage function). The afferent and efferent impulses for receptive relaxation are carried by the vagus (vagovagal reflex) and causes the myenteric plexus to secrete VIP. This transmitter causes relaxation of the wall of the stomach. Vagotomy decreases the receptive relaxation, though, not completely abolishes, because, the intrinsic nerve plexus is responsible for the receptive relaxation. The distal part of the stomach shows digestive peristalsis. The distention of the wall of the distal part of body and antrum stimulates the intrinsic plexus. The smooth muscle in the wall, shows slow waves, which are nonpropagatory depolarization waves. They are also called basic electrical rhythm (BER). The distention of the wall or the activity of vagus causes development of trains or spikes on the peak of slow waves. They are action potentials, developed, when the slow waves reach the threshold level of firing. The entry of Na+ and Ca++ into the cell causes depolarization. Once the action potential spikes are developed, it becomes propagatory in the form of peristalsis. Vagal stimulation, acetylcholine, gastrin, cause development of spikes or action potentials on the peak of slow waves, which results in peristalsis. The digestive peristalsis travel towards the pylorus, pushing the food forwards. The peristalsis is the wave of contraction followed by relaxation. The frequency of digestive peristalsis in the stomach is 3 to 5/min (20 sec rhythm). The food when reaches the pylorus is retropulsed into the antrum, due to the pyloric sphincter closure. The sphincter closes as the peristalsis arrives at the pylorus. This is necessary to prevent the entry of food into the duodenum without thorough mixing and forming acid chyme. The propulsion, mixing and retropulsion in the pylorus breaks down the food into smaller particles (chyme) and helps thorough mixing with the gastric juice. 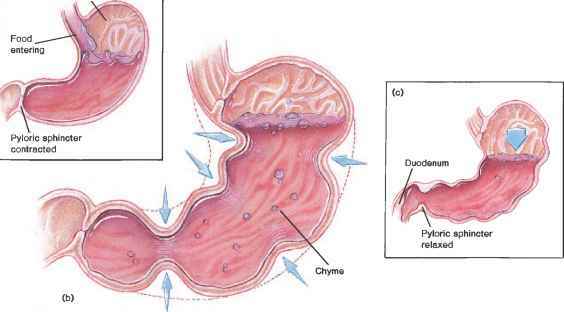 Each time the peristalsis arrives at the pylorus, only 2 to 3 ml of chyme is emptied into the duodenum.